Everyone loves a good story, but have you ever wondered why some stories stay with you while others completely slip your mind? Have you ever listened to someone deliver a presentation and had a difficult time following along or remembering the crux of the story? Why do some executives gain attention and others don’t? Unfortunately, this happens all too frequently in today’s business world. Whether you are a CEO of a Fortune 500 company or a small business owner, stories should be at the core of every marketing effort. From developing ads to building sales presentations, sharing your company’s message through stories helps engage the hearts and minds of your audiences and persuades them to believe in you, your people, products, services and causes. While the communication medium may change, the fundamental elements of storytelling remain the same if you want to bring interest, personality and life to your organization. What makes a good story? A review of the great stories in history – those we can easily recall and repeat to others – reveals seven core elements that all stories share. Remembering these elements as you make those ads and presentations will help you create richer, more powerful stories that inspire your customers, employees and shareholders to remember, retell and take action on your story. 1. Forge the Foundation: Define your goal and audience and choose the medium and messenger to whom your audience can relate. 2. Grab Attention: Disrupt your audience’s routine. What about your story is going to make people focus on what you have to say? Do you have new data that is surprising? 3. Establish the Setting: Pull your audience in by setting context and providing vivid detail that allows people to experience the story as you did. 4. Humanize: Connect with your audience by casting sympathetic characters that spark emotion. Stories aren’t about products, they’re about people. 5. Build Tension: Clearly define the conflict, journey and resolution. Every good story has some kind of tension. Make it clear what would have happened if you didn’t follow a particular direction. 7. Communicate the Outcome: Explain what changed and explain why it matters to your audience. Are you making it clear what action you want people to take? Understanding and consistently practicing these seven elements to tell memorable stories about your innovative people, partners or unique products will help you tap into your inner Mark Twain and become your company’s Chief Storytelling Officer. 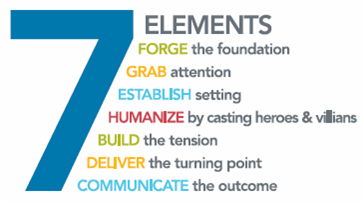 Tagged 7 Elements of Storytelling, storytelling, Tim Fry, weber shandwick seattle.